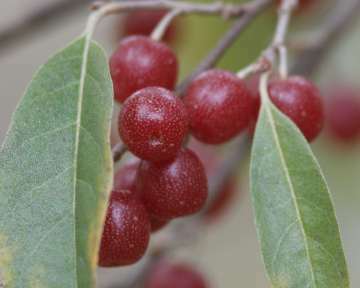 Invasive autumn olive shrubs bear abundant, juicy, pea-sized red berries flecked with silver. They make a tasty fruit leather in the fall. Part of the fun of fall in Westborough is the colorful show that nature puts on. Summer’s mass of greenery dissolves before our eyes into individual trees, shrubs, and vines as these plants develop colors in their leaves or fruit. Suddenly we can pick out and identify different plants, both native and invasive. We watch as the colors and timing of leaves and fruit of native plants give our local landscape that comfortable, familiar look that we recognize and relish each fall. The red maples near the swamp in a nearby hollow usually show color first, as pure red overtakes their leaves. Some older, well established red maples wait longer. The sugar maple in the front yard gradually takes on multiple hues of red, orange, and yellow, while the Virginia creeper on the back fence becomes a blaze of red foliage signaling tiny blue berries. We spot stands of poplar (aspen) with yellow leaves shimmering in the autumn breezes. Gray birches also glow yellow. Blueberry shrubs in woodlands and poison ivy vines on trees add red to understory. Little bluestem grass turns russet on roadsides and in fields, with silvery tufts of seeds. Winds take the early fall foliage and our landscape gradually gives way to the deep reds, oranges, and golden browns of various oaks. Their brown acorns hang overhead and then roll underfoot. Witch-hazel leaves drop off to reveal spidery yellow blossoms, the last flowers of the growing season. Bright red winterberries adorn bare branches in wetlands. Unchanging deep greens offer contrast – white pines, hemlocks, and red cedars among the trees, with princess pine, ground cedar, and mosses on the forest floor. Invasive plants weren’t always obvious in the fall landscapes that many of us grew up with, but we see them now, especially along the edges of lawns, roads, fields, and trails. The small red berries of multiflora rose are abundant in September but disappear fast into the mouths of birds until only a few berries remain. Uniformly red burning bushes dot the landscape. The yellow foliage of oriental bittersweet vines hides other plants and then drops, displaying red berries and their orange capsules. The brown-orange stems of Japanese knotweed persist as a backdrop in places for some time after its leaves are down. Leaves that remain green far into autumn tip us off to some invasives. In our yards and along our streets, those maples that are last to lose their leaves (and eventually turn yellow or just brown) are Norway maples, now recognized as invasive. The shrubs that stay green the longest in the woods often prove to be Japanese honeysuckles taking over the understory. This habit of hanging on longer to their leaves – which serve as energy-gathering solar panels – helps to give these invasives an edge in competing with native plants. Autumn olive (Elaeagnus umbellata) is a lesser-known invasive shrub that we can spot now in our landscape, particularly along edges. You can also recognize it year-round by its various muted colors. At this time of year its foliage fades to dull yellow and its branches are laden with pea-sized, juicy, dark red berries flecked with silver. They’re a favorite of birds and some people as well. 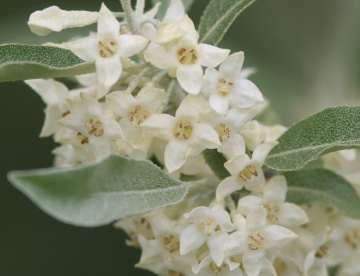 In the spring, autumn olive has distinctive gray-green foliage and loads of small, creamy white, fragrant blossoms. Look for invasive autumn olive shrubs along the edges of fields, roads, and trails. They thrive in poor soil and dry areas, as well as elsewhere. In May-June this shrub stands out because of its light gray-green foliage and scads of fragrant, creamy white blossoms. The grayish leaf color reminds folks of olive trees, but the shrub isn’t related to olive (Olea europaea). Some people mistake it for Russian olive (Elaeagnus angustifolia), a similar-looking European shrub that has yellow rather than red berries. Where did autumn olive come from? It’s native to Korea, China, and Japan, where it grows in many environments but isn’t invasive. It was first imported to this country as long ago as 1830 to cover barren landscapes and conserve soil. In the 1950s it was widely planted along highways and interchanges, and it became popular as a planting to attract birds and wildlife. At this point you might be thinking, “Remind me – what’s so bad about this plant?” The problem is that it’s too successful here. People eventually noticed how readily it spread and replaced native vegetation. As with so many invasive plants, it has advantages that might help it grow anywhere, but here it also lacks the particular insects, diseases, and competitors that keep it in check in its native Asia. Another reason for autumn olive’s success is its dense foliage, which shades out other plants. A third reason is its abundant fruit, which lures birds and wildlife into eating it and spreading its seeds far and wide in their droppings. A single shrub can produce 80 pounds of fruit and 20,000-80,000 seeds each year. Fortunately, there’s a way to enjoy the success of autumn olive instead of just worrying about it. We can eat those abundant berries! People who enjoy gathering wild foods often recommend making fruit leather with them – in kids’ terms, fruit roll-ups. The berries can taste tart or semi-sweet, depending on the particular bush, so the first step is to find a bush with fruit that you like. Then gather lots of berries. Most recipes call for covering them with water and simmering for about half an hour, and then putting them through a sieve or food mill to remove the seeds. Spread the pulp on plastic wrap in baking sheets with sides, and dry it in a warm oven (140-150 degrees) overnight or 8-10 hours.